Life without a dog was miserable, says Sue Beriau of Forest Dale, VT. She and her husband had had dogs for 20 years – first Gyp, then Bobby and Zoe. When the last of them passed away, the couple was bereft. Sue had a trip to Europe planned, but as soon as she got home, she began checking Petfinder, determined to fill the void in their home. Sue saw several dogs she was interested in, but she kept coming back to Maddie Rose, an older dog whose original person in Arkansas could no longer keep her due to his health problems. 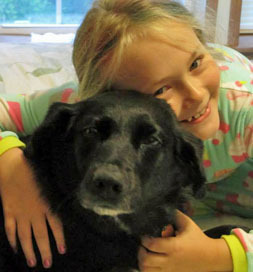 Through a cooperative effort between shelters, the dog was listed on Petfinder by For Dog’s Sake in Manchester, NH, and once the application process was complete, Maddie was brought to the Northeast by a transport. “We firmly believe our other puppers over the rainbow bridge picked her out for us … because we kept going back to Maddie,” Sue says. They picked her up in Kittery, ME. Maddie Rose settled into her new home without a hitch. “She was a little shy but full of kisses right from the start,” Sue says. At dinnertime, she does a little happy dance and then eats very daintily. The Beriaus are so pleased with Maddie Rose that they have adopted another dog, Reilly Cooper. He has been in a foster home, so Sue has learned quite a bit about him from his fosterer – that he is very timid and is a momma’s boy. (Maddie Rose is a daddy’s girl, so each of the Beriaus will be favored by one of the dogs.) Reilly arrives this week from Mississippi on a transport like Maddie. The patter of four-leggers is definitely back at the Beriaus.